Place of endless skies, dust-red plains and palm-fringed rivers, Samburu National Reserve lies on the fringes of the vast and arid desert once known as the Northern Frontier District, whose heat-scorched scrublands extend all the way to the jade-green waters of Lake Turkana and beyond. Physically dramatic, the 104 sq kilometre landscape of the Reserve features rocky battlements, craggy scarps, dry river beds and fallen boulders rising out of the thorn scrub against a backdrop of the far-distant hills and the great red table mountain known as Lololokwi. As for wildlife, Samburu provides one of the few sanctuaries in Kenya for the endangered Grevy�s zebra, the rare beisa oryx and the blue-shanked Somali ostrich whilst large herds of elephant roam the gaunt hills during the day before returning to bathe on the banks of the river in the evening. 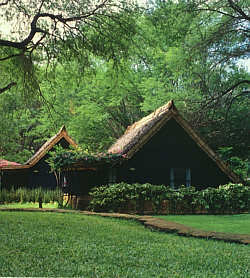 The long, low, shingled buildings of the lodge blend seamlessly into the soft green of the acacia woodlands lining the banks of the languid brown loops of the Uaso Nyiro River, whilst the architectural style makes optimum use of soft local stone and traditional Samburu building motifs. The cool of the interior, meanwhile, reflects a strong �khaki and canvas� safari influence enriched by a vibrant selection of age-old Samburu masks, spears and ceremonial treasures. At Samburu Serena Lodge, each room is accommodated in a prettily shingled timber cottage with its own blossomed veranda looking out over the river. 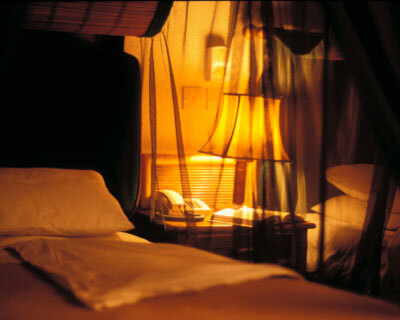 The d�cor melds world-class luxury with quintessential Africa and features a tranquil blend of traditional safari colours, draped nets, soft lamps and stunning Samburu art. The breeze-cooled bar and dining area overlooks the flood-lit expanses of the river and game viewing arena where lumbering herds of elephant gather nightly and shy leopards are lured to the forked branch of an acacia tree where a haunch of meat has been laid out for them. Menus are styled to feature traditional bush barbecues, spicy ethnic cuisine, internationally-themed dishes and a broad selection of hearty safari favourites.